Today I’m sharing some photography tips (and a little of “what’s in my bag”) that I’ve learned over what seems like a lifetime of taking photos! Just a little background. I’ve been selling products on~line since the late 90’s, so I’ve taken thousands of photos and learned a lot by trial and error. I “shudder” to look at some of the old stuff, hah! It’s a process and there is a learning curve, but if you put the time in to practice and then practice some more (and more again) you’ll begin to see the results quickly. Just do it…rinse and repeat over and over! I’m a natural light photographer by preference and the first thing that I generally do when shooting products, styling a room or shooting for a magazine piece is to look for a great source of light. However, even if you shoot indoors next to a window the weather may not cooperate and you may have to play with your camera settings to adjust for that. Try to learn to shoot in manual! On DSLR cameras automatic photos just look so flat and to look good on the internet you will likely have to heavily edit and lighten them up. 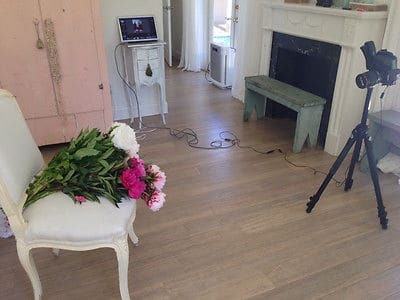 There are many great guides to learn to shoot manually,YouTube videos, and CreativeLive with FREE on~line classes (and paid courses) that are fantastic! A good tripod can really be your friend when shooting indoors. 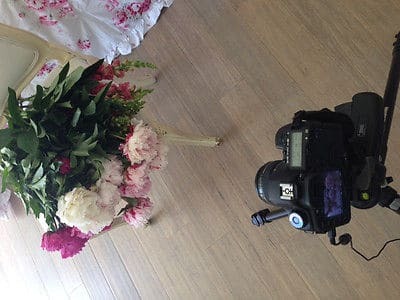 I shoot with a full frame camera and my tripod is pretty heavy duty, but you may not need that so shop around for what suits your needs and budget. 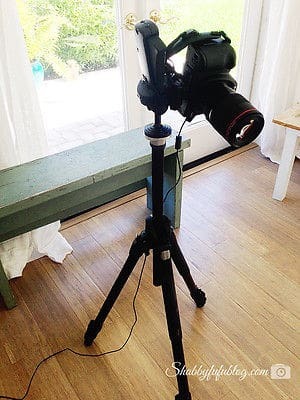 When shooting indoors you may need a longer exposure, so a tripod is definitely something that you’ll want to have for clear and crisp shots. Once I have my location set for the shoot (preferably by a window!) I’ll take a few test shots. Sometimes I’ll use my smart phone and take a few shots to see how things look, but I prefer to set things up in “live view” mode. That allows you to see live what you’ll be taking a photo of. 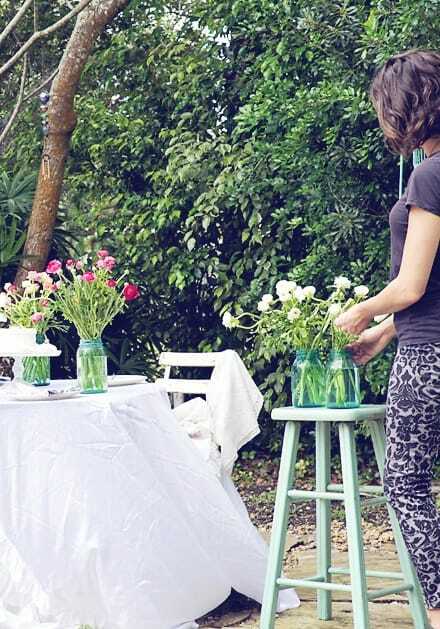 If something needs to be moved it’s helpful and can save time in shooting photo after photo only to notice that your cat’s tail is in the shot! If you have someone helping you with the styling, live view is a great tool and allows you to be a big time director. Admittedly I don’t always take the time to shoot tethered, but if I’m shooting for publication or print I find it so helpful. You will need to have your laptop close by and connecting cables to use between the camera and the computer. Shooting tethered I capture my images directly into Adobe Lightroom and can view each image as it comes in and then adjustment in Adobe Photoshop. You can also use PicMonkey, which has less of a learning curve and has a free version. When I first made the move from film cameras to point and shoot and then to my first DSLR, I used a Canon Rebel. Both of my daughters have the Canon Rebel and LOVE them and they are budget friendly and a great crop body camera for learning and easy on the budget! I’ve progressed over the years to several camera bodies and Canon has great resale value. I now shoot with a Canon 5D MKIII, which is a full frame, but a less expensive full frame camera that gives great results is the Canon 6D. I have several lenses in my bag for various purposes, and if you are just starting out a great all around lens would be a 50mm and they can be quite affordable (less than $100) and versatile. My own favorite “go to” lens is a zoom for shooting both indoors and out and is the Canon 24-105mm F/4 L, and I’ve used it for years and it’s what I generally use for the blog. Workhorse! 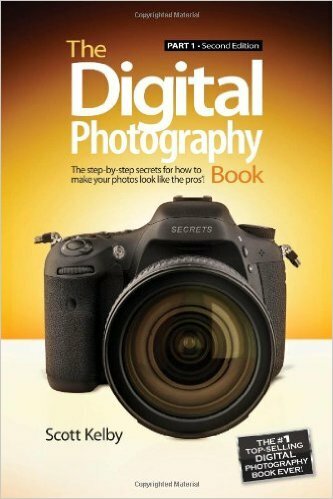 Don’t be afraid to learn new techniques and reading books on photography is a great way to understand the process. Mistakes help you learn and once you start you won’t want to stop! This post has some affiliate links meaning that should you make a purchase I receive a small commission and you pay nothing extra. Great info! I'm still using my 50D. I use my 50mm a lot. Thanks for sharing all your tips!! So glad to see you mention the canon 6D since that is what I just purchased last month. I'm loving it. I need to get a new tripod since I have a rather cheap one, but it was fine with the rebel, but the new camera with the heavy lens needs a stronger tripod. I also got the Scott Kelby book when I bought the rebel. Great tips Janet–I need a better camera! thanks for this. and I too, need a better camera. I'm not good at this. Oh Janet, this post is SOOO timely!!! I love my Nikon and just need to jump in and NOT select the general settings. My goal for the year is to have an online store — your input has helped me SOOO much! Great tips Janet…I find it hard when you have to lean in get in certain positions to get shots with a tripod….If you ever have a photography class, let me know…I will book it down there!!! 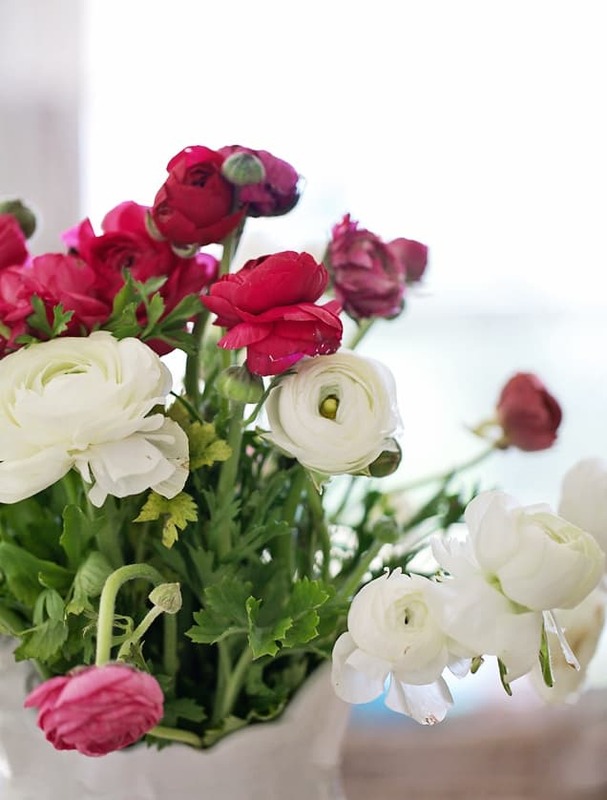 I always appreciate new photography tips and have always admired your gorgeous photos. I'm currently waiting for my new lens to arrive and will finally attempt using my tripod that had been sitting in a corner for years, now. I really wish that I could find a local class without having to drive an hour to find one. I should check out one of the books that you recommended. Thanks for the tips and beautiful pics for today! Thank you for all the camera advice. I use a point and shoot Olympic, but have been considering upgrading to a better camera. Your advice about which lens you use is very helpful to me trying to decide which lens to begin with. You pictures are beautiful. The tips are great. A tripod would be best for me. I bought a nice camera once and sold it because my hands tremor and all of my pictures were blurred anyway. Any suggestions for that problem. 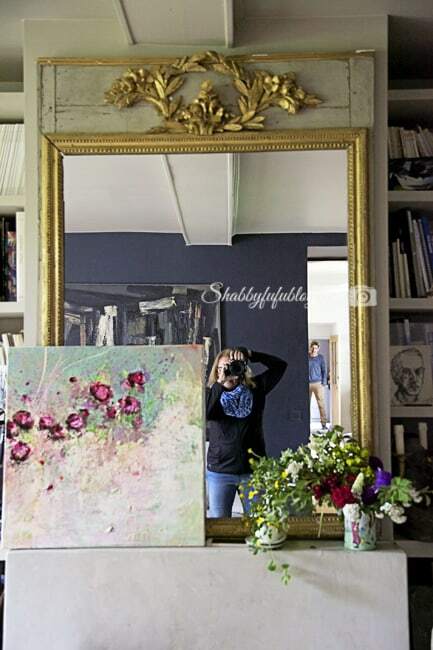 You are great and I always love seeing what you do especially because I love all the shabby chic. Great tips for us bloggers. I am always looking for ways to improve my photo skills. I have to look into the YOUTUBE classes and the books you mentioned. I also want to learn about blurring objects. Thank you for the information. Thanks for the tips, very helpful. I only have a cheap camera but you are right the tripod makes a massive difference. These are great tips and I'll have to check out some of your links to classes. I'm going to finally upgrade this year, so these tips are helpful for a newbie. Your photos are fabulous. And I sure need the tips too as I'm very photo challenged. Thanks for sharing. So many great tips, thank you, I really need to start using my remote! Your photo's are stunning as always! So many great tips here. I bought my first DSLR last year and am still getting use to it. Admittedly, more practice is in order. Thank you for this informative post. Better photography is something I would love to learn this year. I really appreciate the learning resources you mentioned. Your pictures are beautiful. I'll be following you. 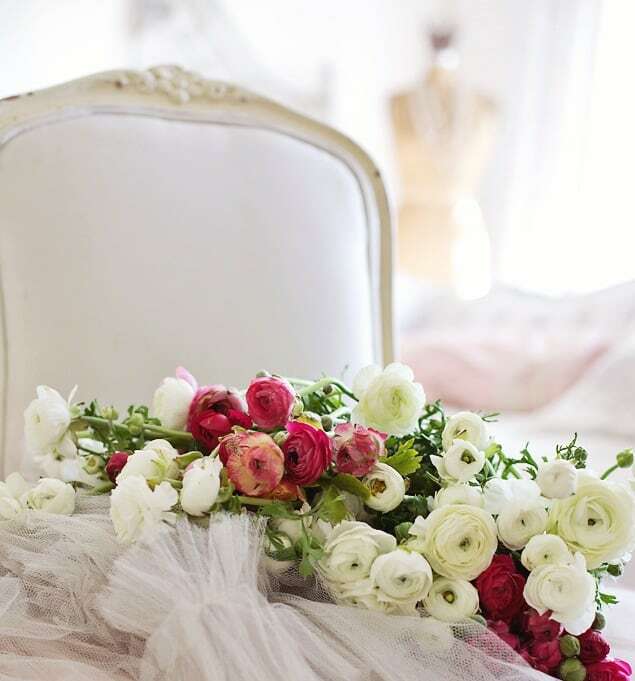 So glad I came across your blog on #whimsywednesday. I will admit I have hit the wall. We live in an older home surrounded by larhe trees , and I just don't have much natural light. It has been a struggle . I am not giving up though! Hi Janet…So, I'm still fairly newish (less than a year) to blogging, as well as serious photography. So much to learn in both areas. 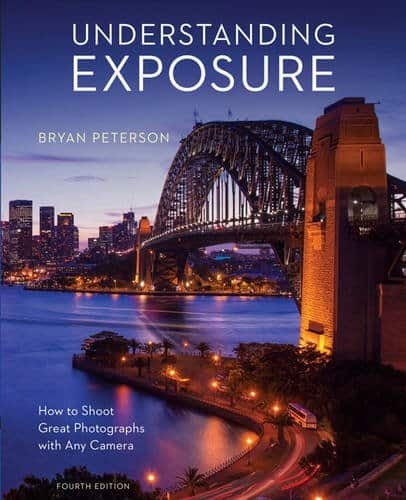 I'm taking a photography course at my local college and our only 'textbook' is the Bryan Peterson book. He really does a great job of explaining heretofore confusing issues. Thanks for taking the time to share what you've learned along the way. Great tips!! I struggle shooting indoors all the time and try to use manual mode as much as I possibly can. I had got to get a good tripod! Thank you so much for all of your advice. And thanks so much for sharing your creativity at the The DIY Collective this week! You have been featured this week at Idea Box. Thank you for all these great tips. I need all the help I can find. Beautiful examples! Excellent tips! This post was very popular at our party this week and will be FEATURED at the upcoming Wonderful Wednesday Blog Hop Congrats!!! Wonderful tips! Shooting tethered is something I keep meaning to try, but always seem to be shooting "in the moment" lol Thank you for sharing with us at Merry Monday! You are a sweet heart to take time from your busy schedule to write this. I truly appreciate this imnformation. This is the area I need help.